It seems that origami is making its mark in the world of weddings. Lovely pieces of carefully folded paper, in the shape of cranes and flowers, are adding to the style of many wedding ceremonies and receptions. The gorgeous papers used to fold these delicate creations is admirable. The crane shape seems to be the most popular, as it has special meaning in the ancient Japanese culture. It is said that anyone who folds 1,000 origami cranes will be granted one special wish. 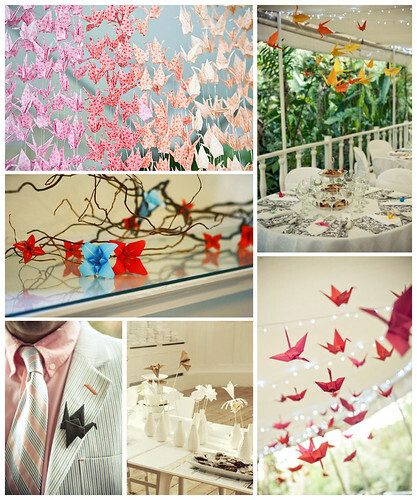 With that said, 1,000 cranes would be a very fitting backdrop for a wedding ceremony -- don’t you think? And for those of you who are romantics, add sentimental value to your origami art by using old love letters or notes from your sweetheart to construct the folded cranes.